If you play golf in cold weather, you have to do something about your ears. A knit cap is nice and warm, but it doesn’t have a bill, and you need a bill to shade your eyes when the sun is low in the sky. The traditional solution is to wear a knit cap on top of a regular golf cap. That’s not ideal, though, because unless you pull the knit cap down almost all the way to your shoulders it will try to pinch-lift the regular golf cap off your head. 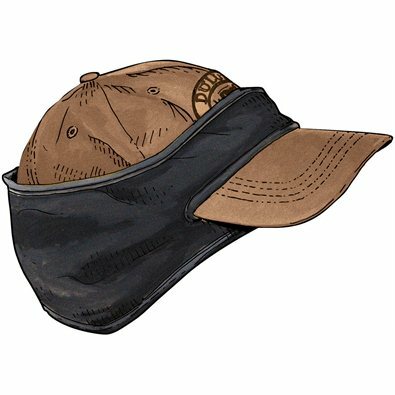 Recently, I found a solution: the Ball Cap Ear Band, from the Duluth Trading Co., currently on sale for $7.99. It keeps your ears well covered, and it has a slit for the bill of your golf cap, and the part that goes across your forehead helps to keep your face warm. And if you’re still cold you can wear a regular knit cap on top of it, or add one of those whole-head things that skiers sometimes wear–as I had to do on New Year’s Day in Atlantic City in 2009 (see alarming photo in previous post). This entry was posted in Accessories and tagged Hats by David Owen. Bookmark the permalink.